In his 1942 book, Life Now and Forever, Arthur J. Wills, Ph.D., a British-born American civil engineer and architect as well as president of the U.S. College of Psychic Science and Research, wrote that he had observed some two-thousand materializations over his years of research and that perfect or near-perfect representations of the spirit form were very rare. Most involved varying degrees of imperfection, many of them just two dimensional. Wills recalled one manifestation in which his deceased younger brother appeared, first clean shaven, but then he saw a dark mustache gradually form on his brother’s face. This seems consistent with the explanation in my last blog entry that the spirit entity must visualize what he looked like and project that image into the ectoplasm. That is, the younger brother remembered at some point that he had a mustache and added it by thought projection. 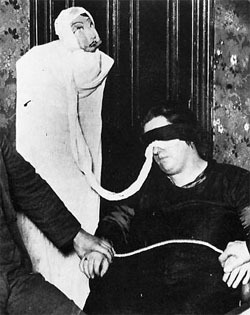 While mostly white, the ectoplasm Wills observed was occasionally black, gray, purple and other colors. “Sometimes the visibility is clear and sharp, at other times hazy,” he wrote. He added that since he was mentally active and keenly interested, measuring mentally the width of the border, noting its colour, studying its construction, etc., he was not in the proper state for hallucination. This took place under adequate red light and with strict controls, including strip searching the medium beforehand and someone sitting on each side of the medium holding each hand. “Some figures disappeared into the floor and some, as the head vanished into the floor, held up their hands and waved a farewell as the hands melted into the floor also,” Wills reported. 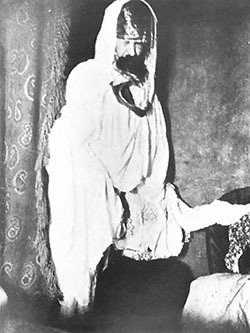 On one occasion, Wills observed the spirit form come out of the materialization cabinet, pass in front of the medium, who was in a semi-trance outside the cabinet, and when the form was about five feet from the medium he (Wills) attempted to speak to the medium, at which point the spirit form instantly stopped, turned facing the medium and became rigid, looking much like a marble statue. It was explained to him that in speaking to the medium he was interfering with the vibrations. As he sat back in his chair and became silent, the spirit form became less rigid and began moving again. A week or so later, Wills attended another sitting in which his wife materialized. She asked him where the scarf was and he told her that he left it at home. His wife then went into the cabinet and came out an instant later wearing the scarf (or its double) lightly dusted over with ectoplasm. A few years later, Wills was sitting with another medium, Charlotte Birkner, when his wife materialized. Hoping that she would appear, Will had brought the scarf along. He handed it to her at her request; she draped it around her neck, and then disappeared into the cabinet. The scarf was nowhere to be found, but Wills later discovered it next to his bed at home. It is difficult not to laugh or even scoff at some of the photos of supposed materialized spirits one comes across in books or on the Internet. Some of these photos are hokey, bizarre, and absolutely ridiculous. Who in his right mind would possibly believe that such ludicrous objects are spirits of the dead? Consider the photo below, which shows a supposed spirit form developing out of ectoplasm produced by British medium Helen Duncan. Clearly, it is a fake, right? I wouldn’t be so sure. At least, the photo in itself does not prove that Duncan was a fraud, as any “rational” person might assume. Richet’s comments might very well explain why the Duncan materialization appears so imperfect. That is, it was incomplete and may never have progressed beyond that point because the medium was not strong enough or the discarnate attempting to materialize was incapable of doing so. In one sitting, a communicating entity told Richet that he was unable to materialize because he could not remember what he looked like when alive. However, the spirit later materialized without a face. However, when Marryat persuaded Powles to show himself, she saw only a face that didn’t resemble her old friend in the slightest. She wrote that it was “hard, stiff, and unlifelike. Powles then told her that he would try to do better the next time. For the next sitting, Marryat brought along a necktie that had belonged to Powles, keeping it in her pocket and telling no one about it. Soon after the séance began, Peter told Marryat to hand over the necktie and put it on Powles’ neck. “The face of John Powles appeared, very different from the time before, as he had his own features and complexion, but his hair and beard which were auburn during life, appeared phosphoric, as though made by living fire,” Marryat wrote, adding that she then mounted a chair, put the tie around his neck and asked if she could kiss him. Powles shook his head, but Peter then told her to give him her hand. “I did so, and as he kissed it his moustaches burned me,” Marryat wrote. “I cannot account for it. I can only relate the fact. After which he disappeared with the necktie, which I have never seen since, though we searched the little room for it thoroughly”. As I understand it from other research in this area, the discarnate must visualize his or her old self and project that image into the ectoplasm. The ability of discarnates to do this apparently varies as much as artistic ability varies among incarnates. While some people have artistic talents and might do a good self portrait, my self-portrait would look more ridiculous than the Duncan materialization above. When William T. Stead first materialized after dying in the Titanic disaster, only his face appeared. When he was asked about this, he said that he visualized only his face. He explained that it was explained to him by other entities that he had to visualize himself among the people in the flesh and imagine that he was standing there in the flesh with a strong light thrown upon himself. “Hold the visualization very deliberately and in detail, and keep it fixed upon my mind, that at that moment I was there and they were conscious of it,” Stead explained. It was in the same way he was able to get a message through. He stood by the most sensitive person there, concentrated his mind on a short sentence, and repeated it with much emphasis and deliberation until he could hear part of it spoken by the person. Although I cannot immediately recall the reference, I do remember a case in which a researcher asked a spirit to show himself on a photographic plate. The spirit said he had to quickly visit his old home to view a photograph of himself before he could project his image on to the photographic plate, as he, too, didn’t remember what he looked like when alive. . He returned in a matter of seconds and the photograph that developed looked very much like the portrait on the mantel at his old house. Likewise, materializations of Sir Arthur Conan Doyle and Raymond Lodge which manifested in the research of Dr. T. Glen Hamilton of Canada looked like old photos of them, which immediately suggested fraud. But think about it, if you had to telepathically project an image of yourself to someone, what would the self-image be based on? What you see when shaving or applying make-up in the morning or a good photograph of yourself? I’m pretty sure that I would visualize myself based on a 40-year-old photograph. I know that when I sometimes look in the mirror I wonder who it is looking back at me and that person in the mirror does not match the more idealized likeness I have of myself. And I know that when I think of my brother, who died in an accident 40 years ago, I picture him as he appeared in a high-school graduation photo, not as he appeared in some fleeting moment in our interaction during his lifetime. This might also explain why several early materialized spirits looked something like the medium. The most famous case in this regard is that of Katie King, who materialized through the mediumship of Florence Cook. Because many observers concluded that Katie looked like Florence, there was speculation that Florence was somehow doing a fast costume change, even though the room was thoroughly investigated beforehand and no costumes found. But Sir William Crookes, a famous British scientist, said that Katie was much taller than Florence and, in fact, saw them both at the same time – Florence in trance inside the cabinet and Katie in a materialized form. The reason that Katie looked so much like Florence may have been because Katie lived before photography and did not have a fixed image of herself, only that she was much taller than Florence. Thus, she identified with Florence’s image. As far-fetched as that may seem, it makes more sense, to me at least, than other explanations offered by debunkers. .
“To suggest that these trained observers were all deceived by fraudulent operations, those stupid and very tiresome performances which mislead no one but the uninformed and gullible, is to offer an explanation which offends our reason and shows willful indifference to truth,” Hamilton wrote, referring to Crookes, Richet, Geley, Schrenck-Notzing, Sir Oliver Lodge, Alfred Russel Wallace, and other esteemed men of science who witnessed materializations. Schrenck-Notzing also observed that the cynical press was quick to accept unsubstantiated debunking reports and sensationalize them, thereby defaming innocent people. These sensationalized reports then became “fact” as far as the public was concerned and later became part of standard reference books, muddying up the waters so that people today don’t know what to believe. I find it easier to believe that those esteemed men of science were competent investigators than that they were duped in dozens, even hundreds, of materializations.